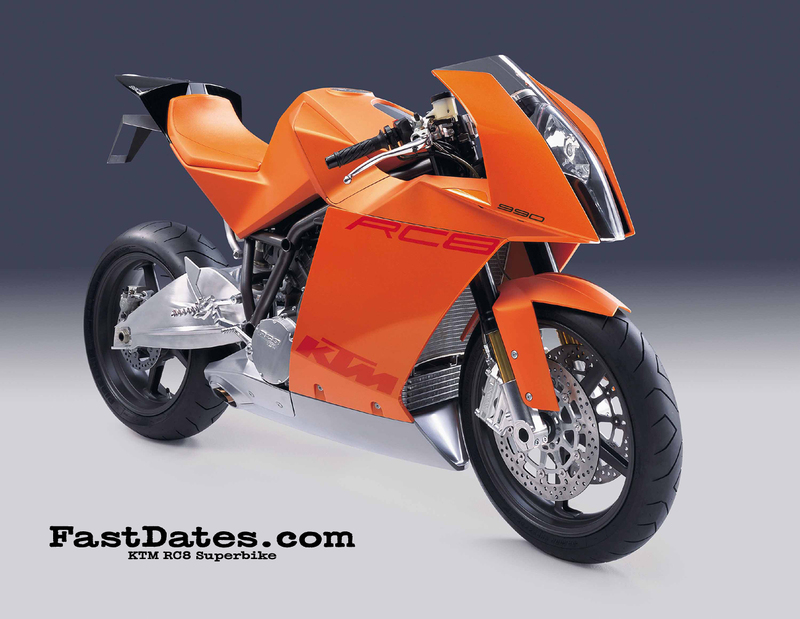 The new KTM 990cc RC8 Superbike Prototype. October 2003 - KTM, one of the world's leading off-road bike manufacturers with World Championship Motocross, Cross Country and SuperMoto titles to its credits, is expanding its motorcycle product line into the streetbike market. 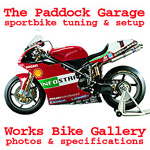 They know, like Ducati, winning performance is what sells bikes to the enthusiast bike markets which they target, so their entry into the streetbike market will be harolded with a new leading edge superbike and a factory team entry in the 2006 World Superbike Championship. 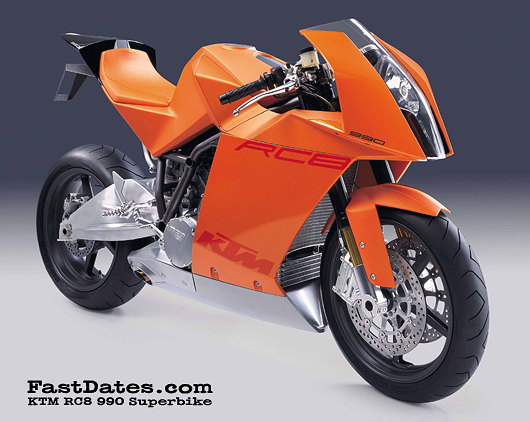 The bike you see here is the RC8, the "concept" or first prototype for the new KTM superbike, unveiled at the Tokyo Motor Show this month. 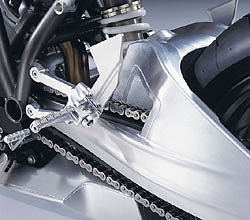 The bike employs a proven Ducati style trelis chromoly tube frame with a stressed member 990cc 75-degree V-Twin engine of KTM's own manufacture. The design is very simple and clean like a dirt bike, and features a few new innovations like the under seat fuel tank, complete under engine exhaust system, and dry sump lubrication (oil tank in the swingarm?). Obviously midsing on this clean looking prototype are the rear view mirrors and turn signal for street use, along with side number panels. 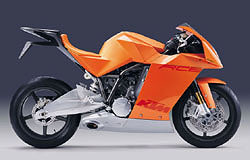 KTM says they welcome the new production based FIM superbike rules which help to reduce costs and it could be conceivable this bike could go into production for well under $20,000. 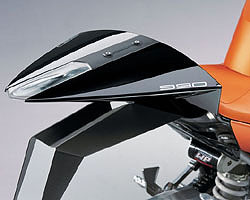 Hopefully KTM can get the bike into production even sooner than 2006 and possibly enter World Superbike in 2005? 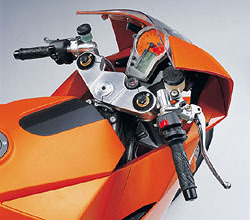 Mattighofen, 22.October 2003: (KTM Press Release) The RC8 CONCEPT BIKE underlines KTM's long term vision for the road. SHE DOES NOT COME IN PEACE - SHE COMES FROM KTM. Those who know KTM, know that only one thing counts with us. We've symbolized uncompromising motor sports for over 50 years. And all that time KTM has fought on the front lines to win. 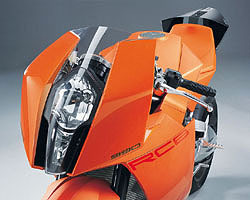 For the RC8, we brought our riders to the design table as well as the best technicians and designers. Our aim: The ultimate weapon for ambitious street-fighters. That means: A radical concentration of its mass around the compact 75° V2. Innovative details are everywhere: The seat is the tank, keeping fuel at the machine's centre of gravity. 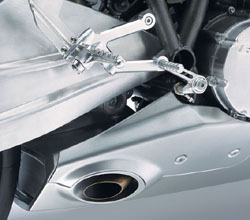 Dry sump lubrication allows the entire exhaust system to sit precisely where it has the least influence on dynamics. Directly under the engine. The fairing is designed to produce: The least possible crosswind drag. The result: No crosswind oscillation, spell-binding agility, and aggressive steering ability. FORM FOLLOWS FUNCTION - FORM FOLLOWS FICTION. Our design approach is very simple. 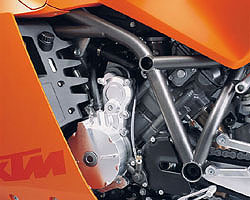 At KTM, an air duct is always - first and foremost - an air duct. First the function, then the beauty. But anyone who stands and beholds her can tell that we don't give the appearances short shrift. Her powerful lines and extreme reduction to the basics characterize her as a unique, wild and emotional motorcycle. A striking statement for our future on the road.